The BTH Model Clearance Sale is finished. 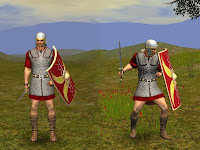 The Roman Soldier project was something that was originally destined for the Dark Ages PW. The collection of Roman soldiers' kit is a series of firsts for me. 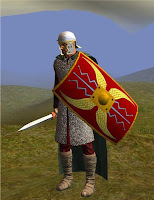 It started with the Scutum (shield) which was the very first shield model I made. Followed by the gladius (short sword) which was my first weapon. 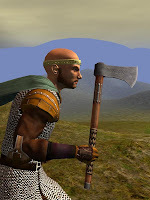 Eventually I made the Galea (helmet), again, my first and only helmet model. Finally I worked my way up to doing the Lorica Hamata (armour). Yep, the first attempt at modelling armour. All the models were complete with the exception of the armour. I stopped work on the armour back in February this year and with the demise of the Dark Ages PW I expected it would remain unfinished. 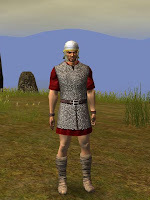 That was until I followed a link that led to Erik Breau's blog on his Europa PW with a fantasy Europe setting. A quick succession of emails with Erik and the models found a home on his PW. Surprisingly, I completed the armour in very short time. I'm glad I finished it and I'm pleased these models will now be used. I'm sure Erik will take good care of them. 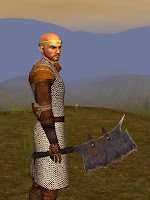 The sword is available in the BTH Weapon Pack and the shield was a new addition to the recently updated BTH Shield Pack. So what now for me? When I started the BTH Model Clearance Sale back in September I gave myself until the end of the year to finish off my 3D work for Neverwinter Nights 2. I've done that now and for the moment I'm undecided as to what to do next. When is a mace not a mace? When you add spikes to it and it becomes a morningstar. You see, I made a mace. Only I made it with spikes. And the more I thought about it the more I decided that it was more like a morningstar. 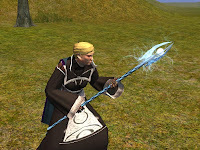 I posed the question to some NWN2 mates and the consensus was: Mace + Spikes = Morningstar. No big deal. I reused the mesh and the texture and replaced the spikes with knobs to make a mace as well. 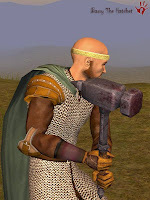 The mace was then scaled into a warmace, making three weapons for the price of one. 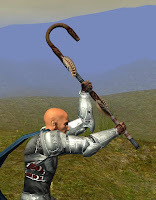 The mace/morningstar were a part of the v1.30 update for the BTH Weapon Pack which added 16 weapons to the pack. 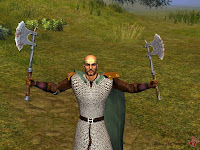 The update also includes the weapons I made for the Shattered Dreams project. I haven't heard anything from the project leaders for a number of months and I assume the project has been abandoned. In any case, it's better to release the models to the community than have them sitting around idle on my hard drive. And so the BTH Model Clearance Sale continues. Next on the agenda is a final update to my Shield Pack. My warehouse is drastically over-stocked. Everything must go! Over the last couple of years I've worked on a number of NWN2 projects that never made it to completion. The rate of project failure has been quite spectacular and I think that is a reflection on how much effort it takes to design and build a quality NWN2 module or persistent world. My only contribution to most of these projects has been to make custom models which is only a small part when you consider the writing, building and scripting that goes into completing a module. Running an amateur gaming project that relies on volunteer contributions must be like herding cats. At the end of the day it seems a shame to have created custom models that won't get used. So I've decided to gather the models that are laying around like unclaimed baggage and release what I can to the vault with the hope that someone can use them. I've updated the BTH Houses hak with models that were done for the terminally ill Dark Ages PW project. 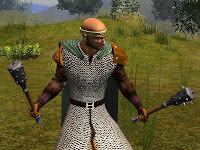 Unfortunately Dark Ages only ever made it to a basic alpha release before being left to wither. A pity. I was looking forward to playing Dark Ages with the AussieNWN guys. Such is life. 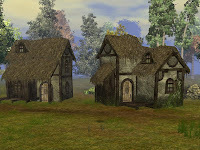 The update to the BTH Houses hak includes 4 re-skinned OC house models plus an inn as well as textures for the Standard Interior tileset that match the external stone or earth walls of the house models. The re-skinned houses have been dirtied up a little in keeping with the rustic feel of the other BTH houses. Over the coming weeks I'll work my way through all the unused models I have and release what I can. I think this will help draw a line under my NWN2 work and tidy up the remaining loose ends. A sense of getting my affairs in order, so to speak. This page is way overdue for an update so I'm going to post a spread of screenshots of some of the weapons and shields that I've made for BouncyRock's Shattered Dreams module and the BTH Weapon Pack. 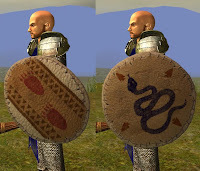 So starting with the Shattered Dreams tribal theme; we have some leather shields and primitive weapons as well as the Axes and Shield carried by Elysius' Knight. 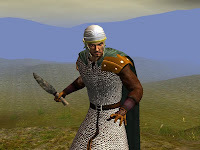 The screenshots are not taken from the Shattered Dreams mod and so the setting is a little out of context (especially the dude wearing a Roman helm while wielding the flint dagger). Nevertheless here they are. Below are the models I recently added to the BTH Weapon Pack. I really enjoyed making these (and the Knight's equipment above) and I went looking for inspiration among the Warhammer Online concept art to help me achieve the tone I was looking for. I love the hammer, all the markings are worn, there are runes embossed in the head and it looks as though it's been around for many a long year. I have a couple more weapons in mind with a similar feel to them. That should keep the Dogs of War happy. And lastly, I was pleased to see my Module Testing Toolkit receive a Hall of Fame award. It's great to see a niche product, like the MTT, get such good support from module builders. So the last five weeks have produced a bit of a mixed bag in terms of my NWN2 work. I've been a little scattered with my efforts as I jumped from one idea to another and from one project to another. BouncyRock's Shattered Dreams module is coming along nicely and you can read more about that on the BouncyRock forums here: BR Shattered Dreams and you can read about the interesting work Elysius is doing on his blog. Now that the module has been announced I'll post some screenshots of the work I've done for Shattered Dreams in the coming weeks. Aussie NWN - Dark Ages PW (the other project I'm working on) has an alpha module ready and is in the early stages of testing. It's been a long time coming but I'm looking forward to this PW coming to life. They are are waiting on the long promised fixes that are set for release with the 1.23 patch. In my last post I mentioned that I was going to try my hand at character skinning and with that in mind I set about making some Roman-like armour to compliment the other work I'd done for Dark Ages. I basically made up a Frankenstein model from bits and pieces using the OC naked model for the arms and legs and one of the chain shirt models for the torso. Bolting all the pieces together was the easy part and once I started to work with the skin modifier, I soon realised how much work it was going to be. It took a lot of experimentation to get the legs working so they didn't break out of the armour during the character animations. 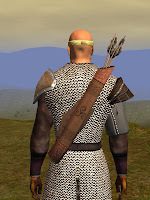 I used a combat animation widget I'd scripted to help me test the new armour and it proved to be a valuable tool. In any case, I managed to tweak the lower part of the model to achieve a very good result. It wasn't until I ran the OC chain shirt model through the same animations that I realised I'd actually improved my model over the OC model in terms of reducing the amount clipping. Having finished the legs I moved to the arms. I completed about 90% of the skinning on this armour before I was distracted by something else but I intend to get back to it soon and complete the model. Here's the model so far. 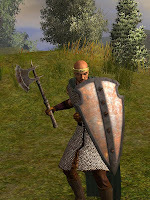 The combat animation widget that I'd used to test the Roman armour was included as part of an update to my Module Testing Toolkit. Along with a module reload widget and some redesigned GUI functionality, the "Ring of the Dancing Warrior" formed part of the MTT v2.01h update and brings up more than six years of work on this toolkit. I could not count the number of hours the MTT has saved me in testing time over the years. This little tool started life as a set of NWN1 scripts that morphed into the DM and player widget used on the Aeon NWN1 PW and in 2007 I re-wrote the core scripts for NWN2, adding a GUI menu to replace the conversation driven menu. If you have any interest in building NWN2 modules you should check out what the MTT can do and how it can help. 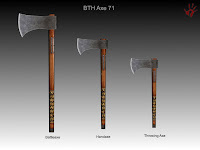 I have also released an update to the BTH Weapon Pack to include four new axe models. Three of which are shown below. 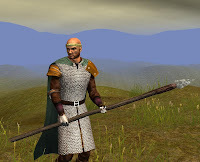 And lastly (and quickly, because my weekly NWN2 multi-player campaign is about to start) I did a re-skin of the arrow quiver model for the Dark Ages PW. So there you have it, a mixed bag of NWN2 goodies. she was wise, subtle, and knew more than one way to skin a cat - Mark Twain : A Connecticut Yankee in King Arthur’s Court. Much of my NWN2 modeling for the past few weeks has been for the BouncyRock project and we have a Secret Squirrel agreement in place and so I haven't been able to write about it here. But after reading Elysius' series of blog entries on creature modeling I decided to experiment with a technique of using a high polygon model to project a normal map that is used on a low polygon model. This is a method I had previously read about but never tried before. Until now, all of my normal maps have been created in Photoshop from grey scale bump maps and converted to normal maps with the nVidia Photoshop plugin. It's proven itself to be a very effective way to make a normal map as can be seen in my shield pack. But while reading Elysius' creature blog I realised I had more or less stagnated in my modeling methods and I was relying on the same set of techniques I had discovered from tutorials when I first started NWN2 modeling. I guess this is one of the dangers of being self taught. If the only tool you have is a hammer, you tend to see every problem as a nail. So I challenged myself to learn some new techniques and experiment with new ways (for me, at least) of doing things. Using a high polygon model as the source for a normal map is a relatively straight forward process. Basically, make a high polygon model with all the detail and a replica low polygon model that the game engine can render. Use the high polygon model to render a normal map that is then applied to the low polygon model. Simple. So I decided to try this out on a Roman helmet model I was making for the AussieNWN Dark Ages NWN2 PW. While it took me a bit of fiddling to get the high poly model the way I wanted it, I think it was worth the time taken to learn the normal map rendering process. The normal map on this model is the combination of high poly normal map rendering blended with a bump map conversion. The Roman helmets often had a highly tinned finish, so it's too bad the NWN2 engine doesn't do reflections. The best I could manage was to set the specularity to represent shiny metal and add a touch of blue colour to the specularity settings. Thanks to Slimer for the tip about using colour. The Dark Ages Roman soldier is coming together slowly. We have a couple of Roman short swords, a shield and now the helm. I'm going to learn how to do character skinning and work on some Roman armour next. It's time I stepped up my modelling from simple items and placeables and moved onto something more challenging. And on another note; the NWN Aeon PW I helped build with Sporaxis and Relexx has been revived by Sporaxis. I put a lot of effort into the custom tilesets for that world (about six or seven tilesets from memory) so it's great to see that the module is being used again. 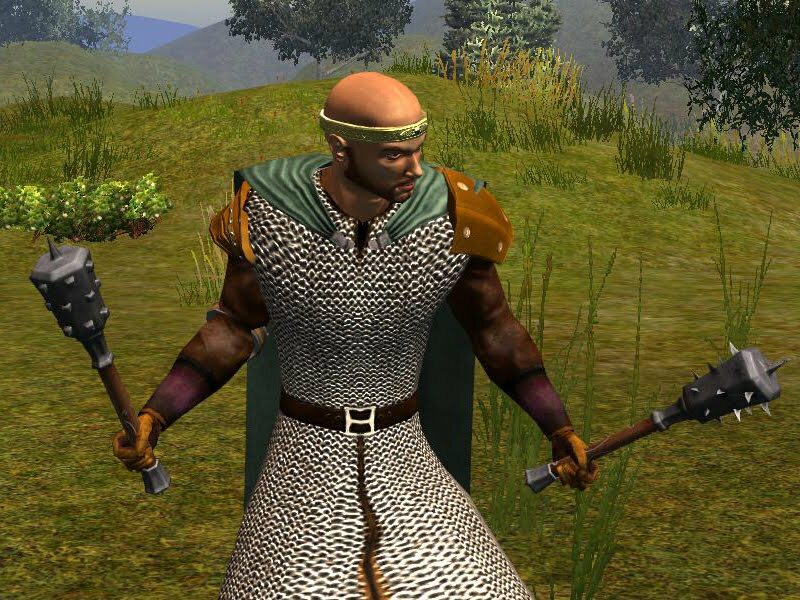 Sporaxis is converting the world from its original custom setting to Forgotten Realms. I wish I knew then, what I know now about modeling and I would have really given those tilesets a good going over. As tempting as it is to fix up some of the old models (like floating rocks lol) I have my hands full with NWN2. You can find the details for the Aeon PW on Sporaxis' forums. Long live the Aeon PW!